This post has been submitted by Amjad Hayder, a high school student in Muscat, he keeps a blog that he updates regularly at http://amjad248.blogspot.com. Please feel free to share your recipes and reviews with the rest of the Omani Cuisine community by emailing us at contact@omanicuisine.com. The other day my friends and I went to this new restaurant in Athaiba called Flavours. 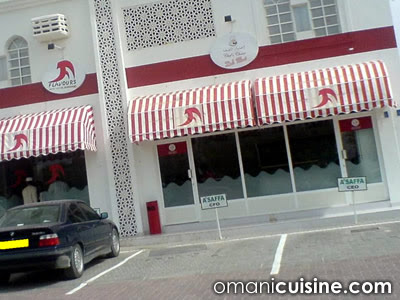 This is a new international cuisine restaurant in Muscat owned by PFI group. It is located off the the Sultan Qaboos Road next to the Mazda showroom in Al Athaiba. We went there for lunch at around 2pm. The customers we saw were mainly employees from different nationalities having their lunch break probably coming to Flavours for its special buffet offer for lunch. The atmosphere at Flavours is great, it is a spacious restaurant with two additional halls, one for families only and the other for ladies only. There is a billiard table and some internet facilities for anyone feeling like hanging out in Flavours. 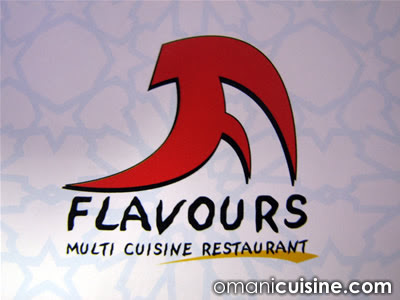 Flavours serves different types of meat or chicken rice meals and sandwitches. Their menu has a variety of items for desserts such cream caramel and fruits. They also serve Baskin Robin’s ice cream. The prices at Flavours are very reasonable. Their special rice and curry buffet is served for 2 riyals only! All their other menu items are also of a similar reasonable price as well. I liked Flavour’s food and prices, but I did not like their waiters. The majority of their staff are Indian, they have one Omani woman and one Omani guy at the counter. I hope that you do not get me wrong, I have nothing against other nationalities, but I got really annoyed by the waiters who did not seem to feel like serving us. We were a group of ten and we stayed for a bit in Flavours, it was quite apparent to us that the waiters were irritated by our stay and one of them stood waiting for us to finish eating to collect the dishes from us. Disregarding the attitude of the waiters, we had a great time at Flavours: great food, great atmosphere and reasonable prices. If you’re looking for these things, do not hesitate to have your lunch after work/college/school at Flavours Restaurant or even having a dinner there with your family or friends.